There is so much to share on the subject of Indo Dutch Culinary Heritage. Luckily the media has shown interest in Indo Dutch Kitchen Secrets to help amplify the message. We need exposure to support our mission: to get America to explore this fascinating cuisine. I have been humbled by rave reviews and warm responses. Especially people from within our community in the US have been appreciative. People write or call to share that all their cookbooks are in Dutch or Indonesian. They are happy to now have something tangible to pass on to their offspring. Not only recipes but also information about history and culture – all in the first ever Indo Dutch Heritage cookbook in English. Also great reviews on Amazon.com have been mostly five-stars. 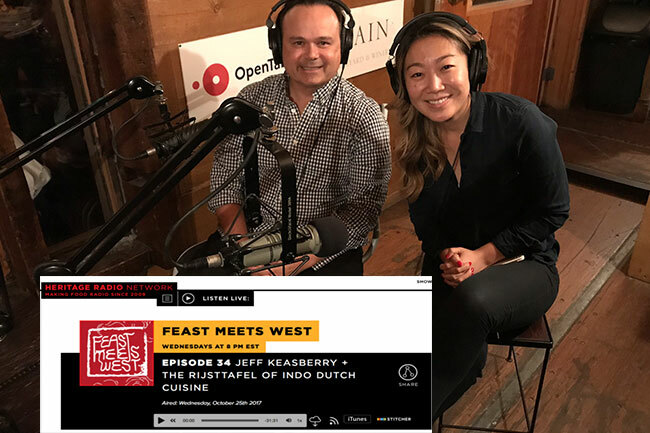 Jeff in the Media: Feast Meets West a Heritage Radio Network production in Brooklyn NY. To help preserve our food customs, the book explains about traditions and etiquette; like how to eat a Rijsttafel. Also find a list of ingredients with translations and where to get them. Please share this message and refer people who might want to write about it and give this cooking style a try. Thanks so much! And now let’s get back to cooking.